Skydiving is, as they say, not for the weak-hearted. That is why it is considered as an extreme sport. While less than 1% of the population actually tries it, there are quite many enthusiasts who enjoy it just by watching skydiving shows and exhibitions. But exactly what does parachuting and skydiving entail? Where did it originate and why is it popular even up to this day? Skydiving has been around far longer than we thought. It traces its roots back in 852 A.D., when Arman Firman, wearing a large cloak, crashed and landed after jumping from a tower in Spain. Most did not consider this as the first parachute jump ever made, since he was only wearing a cloak. While many tried to do the first jump, the first recorded jump was in 1797, when Andre Jacques Garnerin used a silk chute after jumping off a hot-air balloon. As airplanes have become more popular, so has the parachute. During World War II, it was used by soldiers and airplane pilots during emergencies and to transport supplies and equipment in war areas. The military has large groups of highly experience skydiver and paratrooper who are ready to jump into a hostile situation at a moments notice. Since then parachutes are popularly used in shows and exhibitions. 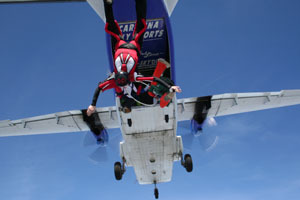 Skydivers jump out of an aircraft flying at an altitude of about 4000 meters or approx. 12,000 feet. They free fall for a short period until a specific altitude when they activate the parachute and cause their speed to decelerate as they land. Cords are used to control direction and speed, so they are able to land at a specific spot. Usually, first-time skydivers are strapped together with a professional or experienced skydiver, in what’s commonly called a tandem skydive, who activates and controls the parachute. But after experiencing a few jumps and mastering one’s flying skills, you’ll have the courage to jump on your own until you are hooked with the sport. The sport may seem dangerous, but surprisingly, there are lesser fatalities now that many people realize. With innovations and safety measures adopted in the US and in most parts of the world, fewer deaths and accidents have occurred in the past years. Among the safety measures is the requirement of a reserved parachute, which must be inspected by a certified parachute rigger. With more than 3 million skydives made per year, statically, skydiving isn’t the most dangerous sport. Also, an automatic activation device or AAD is used to activate the reserve parachute at a specific altitude should the skydiver fails to activate it. Altimeters, both visual and audible ones, are also used to let the skydiver know the altitude he’s in during a jump. Anyone can experience parachuting and skydiving, for a thousand and one reasons. But before doing your first jump, make sure that you learn the basics and safety measures that this dangerous sport demands. And as any professional skydiver or trainer may tell you, always remain calm and enjoy the moment. After all, the thrilling, exhilarating feeling is what brings people to love this sport.